Actually, I didn’t know how I got them. Google just awards you with these according to its own secret algorithm or criteria. Apparently, you can’t ask for them. You also don’t need to ask for them to get them. Also, these sitelinks appear depending on what you type on the search bar. If I type the more specific thefinancemd, the sitelinks appear. If I type only financemd, the sitelinks don’t show up because I don’t rank no. 1. The sitelinks only appear if your site is numero uno on search. 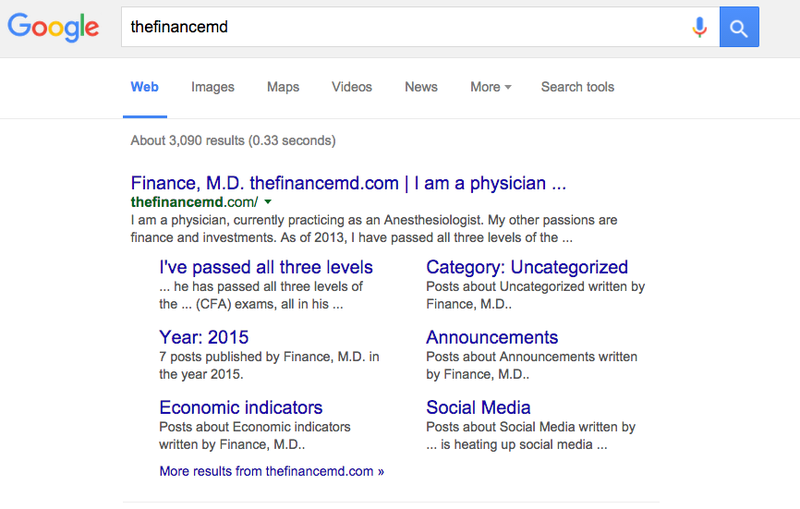 thefinancemd – top search result with sitelinks, yay! What are the benefits of getting sitelinks? How did get these sitelinks? My blog has a distinguishable title. Sure there are many sites for “finance doctor” but thefinancemd is pretty much my blog. I try to write posts with informative and useful content. I don’t post just for the sake of posting. I only post when I have something lengthy to say. You’ll notice my mini-vacations in between posts. Some people actually read my blog, and they find it through search. Most of my views come from search engines. Traffic gets you the sitelinks. My site is easy to navigate. Thanks wordpress free theme! I do internal linking. Some of my posts are related to previous ones so I link to those. That apparently helps. In fact, I am going to internal link right now, to the post when my blog first reached readers from 100 countries – my blog’s recent important milestone. It’s always a challenge for bloggers like me to find the motivation to keep going, especially in this age where blogging is presumed to be dying. The awarding of these Google sitelinks will help me stay on the blogging path.